In the Random Walker project that computes the probability of landing on position p after f flips of the coin there is the need to compute powers of 2. If you click on the green operators tab you will find the [sqrt ( 0 )] block. 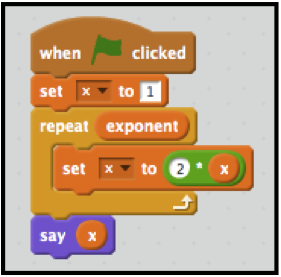 Next to the sqrt in the block is a small downward-pointing triangle that opens a pull-down menu to reveal the list of operators built into Scratch. Note that there is not a 2x operator. By definition, 2x means ‘use 2 as a factor x times’. 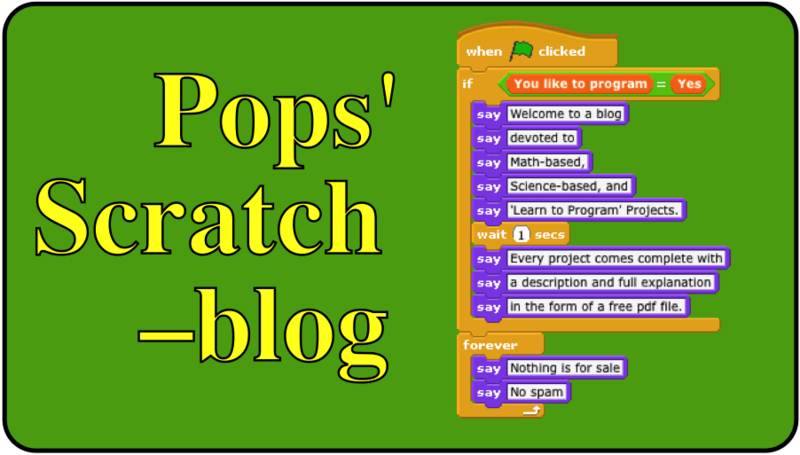 This short script does exactly that and is probably the way most Scratch programmers build a powers of 2 script. I enjoy coding work-arounds but my first thoughts didn’t coalesce around the definition method coded above. 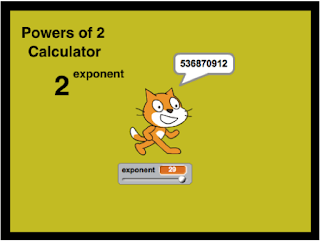 Instead, it focused on another method using logarithms. Let y = 2x. Then taking the logarithm of both sides, log(y) = 2log(x). 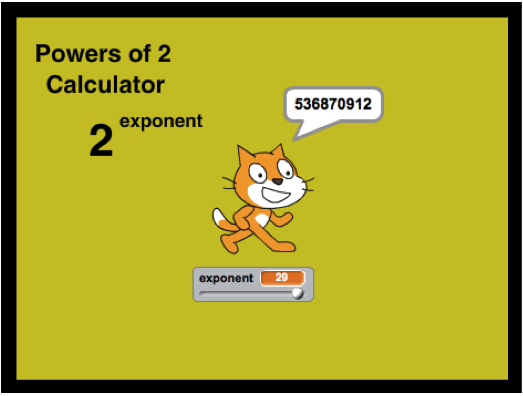 Since x is the exponent, I created a variable in Scratch named exponent. Next, I created a green log of 2 block. I picked a green multiplication block from the green operator menu and set the exponent variable as one factor and the [log of 2] block as the other variable to build the block shown below. There is an inverse (anti-log) block in the green pull down operators menu labeled [10x of ( )] that computes log(y). The [exponent * log of (2)] block is then set into the [10^ of ( )] block. But this computation will be a decimal close to the integer value of 2x. There is a [round ( )] block in the green operators menu. The [(10^ of (exponent)* (log of (2))] is placed in the [round ( )] block. This block is set into a [say ( ) block to report the needed powers of 2. This project can be viewed and downloaded by clicking on the following link.